What’s it like? Currently the only Starwood property in Marrakech, although a W hotel is due to open in the city in December 2011 (see Marrakech hotels round-up). 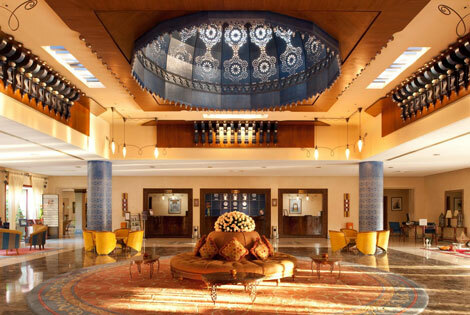 Starwood also has two properties in the Moroccan capital Cassablanca – Le Royal Mansour Meridien, and the Sheraton Cassablanca Hotel and Towers. 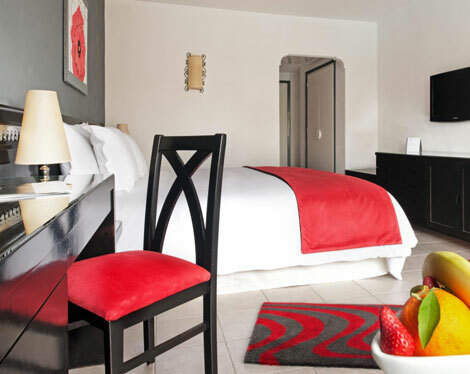 At 277 rooms Le Meridien N’Fis is actually a larger hotel in terms of guest rooms than the nearby Sofitel complex (for a review click here), but it feels smaller, partly due to the less extensive leisure facilities. As with the Sofitel though, the outdoor areas are still the highpoints of this property, with peaceful, well-kept gardens (again with the hotel’s home-grown herbs), and a an outdoor swimming pool lined with free loungers and paid-for shaded cabanas. Regular travellers to Africa and the Indian Ocean should note that Starwood is giving away 1,000,000 SPG points to the member who completes the most stays at Starwood properties in these two regions between now and the end of 2010. For more informaion on the promotion click here. Where is it? On Avenue Mohammed VI, to the south of the modern Gueliz district of the city, and to the west of the old town, with its souks, food stalls and city walls. You can walk to either in 20 minutes, or a taxi should cost no more than MAD 20 (£1.50), although as with most things in Marrakech you’ll need to haggle to get this price. Room facilities My deluxe room felt modern and was decorated with simple white walls, splashes of red from the bedspread and armchair, and hints of Moroccan design in the wall frieze and around the mirror. There was no balcony, but the armchair and coffee table were positioned close to large windows letting in a lot of light into the room, and overlooking the Andalusian gardens. Facilities included a flatscreen TV with satellite channels, air-conditioning, safe, minibar, and a combined bath and shower. Wifi internet access is charged at MAD 150 per day (£11). Business and meetings facilities There are four ground-floor meeting rooms, all with natural daylight and ranging from the 1,850 square foot Halqa suite which can accommodate up to 150 delegates for a reception, down to Isaarag which can accommodate up to ten for a boardroom meeting. Restaurants and bars The hotel has three restaurants – fine dining El Menzeh serving Mediterranean cuisine on two floors, Al Seguia, the hotel’s main buffet restaurant where breakfast, lunch and dinner is served, and Al Birkah, a poolside snack bar. This last option offers lunches including a burger, chips and a beer set menu for under £15, good value in a country where the beer alone can cost half that amount. The breakfast offering was extensive, with a good range of hot and cold buffet options, omelette and pancake stations, and a la carte choices also available. The “LM Eye Openers” juices are were a try, with interesting combinations of flavours including cherry, lemon and black pepper, and raspberry, pineapple and clove. My only grumble is that staff were not particularly quick to clear tables and refresh empty food stands, which meant that on both mornings of my stay i sat at an uncleared table, and had to hunt for a teaspoon to stir my coffee. Adjacent to this area and overlooking the hotel’s Andalusian gardens is a canopy-covered Moroccan tea house, pleasantly decked out in low sofas and throws, where guests can drink the typical sweet mint tea, hire shishas, and listen to live music in ther evenings. Leisure facilities The large outdoor swimming pool is surrounded by loungers and double-bed cabanas, as well as a small bar at one end, and the poolside snack bar at the other end. Aside from this the hotel features a gym, two outdoor tennis courts, and a ground-floor spa facility with hammam and sauna. As part of Le Meridien’s “Unlock Art” programme, hotels within the brand offer free access to “contemporary cultural institutions”, and in this case guests can visit Le Jardin Majorelle, around ten minutes by taxi from the hotel. Named after the artist Jaques Majorelle who designed the space, and owned by the late fashion icon Yves Saint Laurent, the beautiful botanical gardens are well worth a visit for the rare cacti, palm trees and bamboo plants, as well as the bold colbalt blue colours of the pots and garden walls. Verdict Bright, simply decorated rooms overlooking Andalusian gardens and swimming pool, this hotel is a peaceful base from which to explore the hustle and bustle of Marrakech. Hotel highlights The peaceful Andalusian gardens and outdoor pool. Price Fully flexible internet rates for a midweek stay in September started from MAD 1,200 (£90) for a deluxe room.